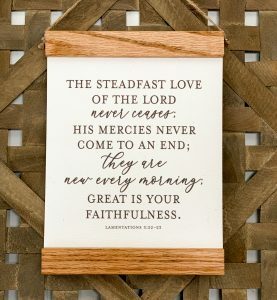 (Some links in this post are affiliate links which means I earn a percentage, at no cost to you, when you purchase. See my disclosure policy here.) 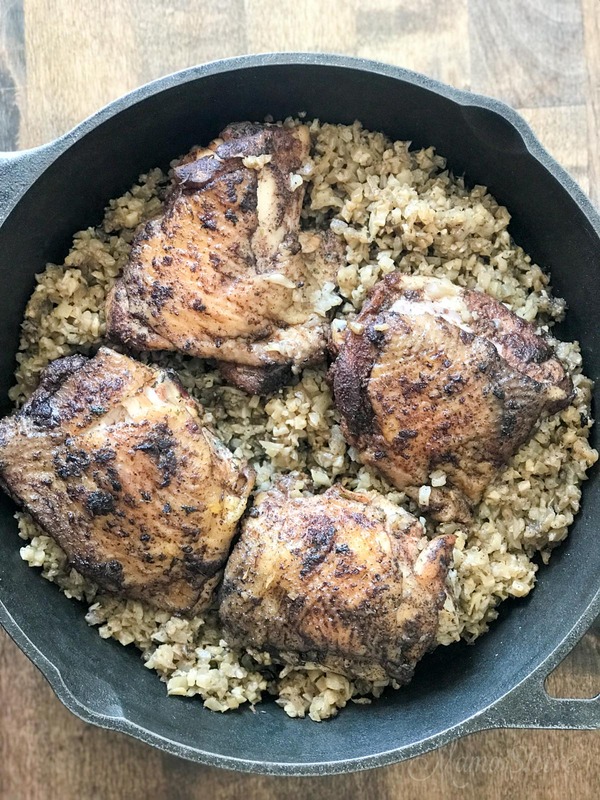 *I did receive this Easy Keto Dinner Cookbook for free. All views are my own! 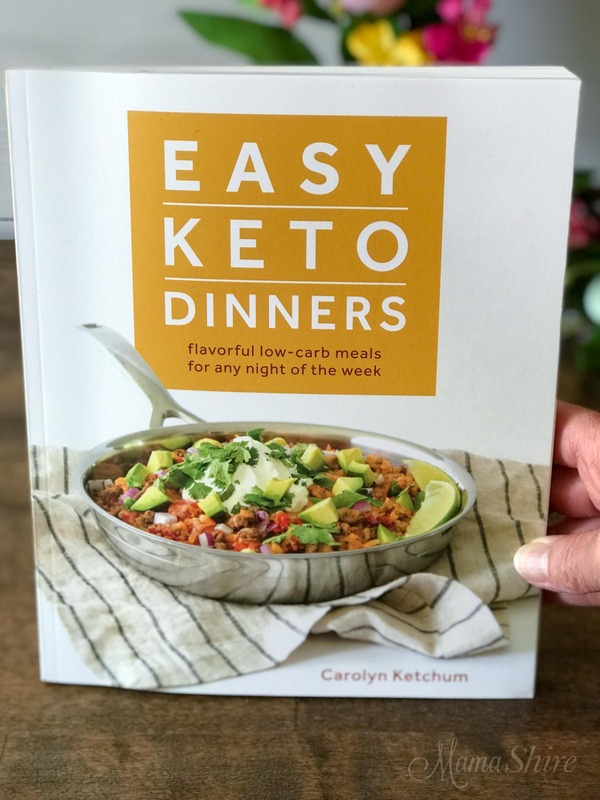 This easy to make dinner recipe is from Carolyn Ketchum’s brand new cookbook Easy Keto Dinners! It’s coming out in just a few days and is available for pre-order now! I’ve been having so much fun looking through this cookbook and trying to decide what I wanted to make first! Carolyn was so kind to let me share one of her recipes with you! 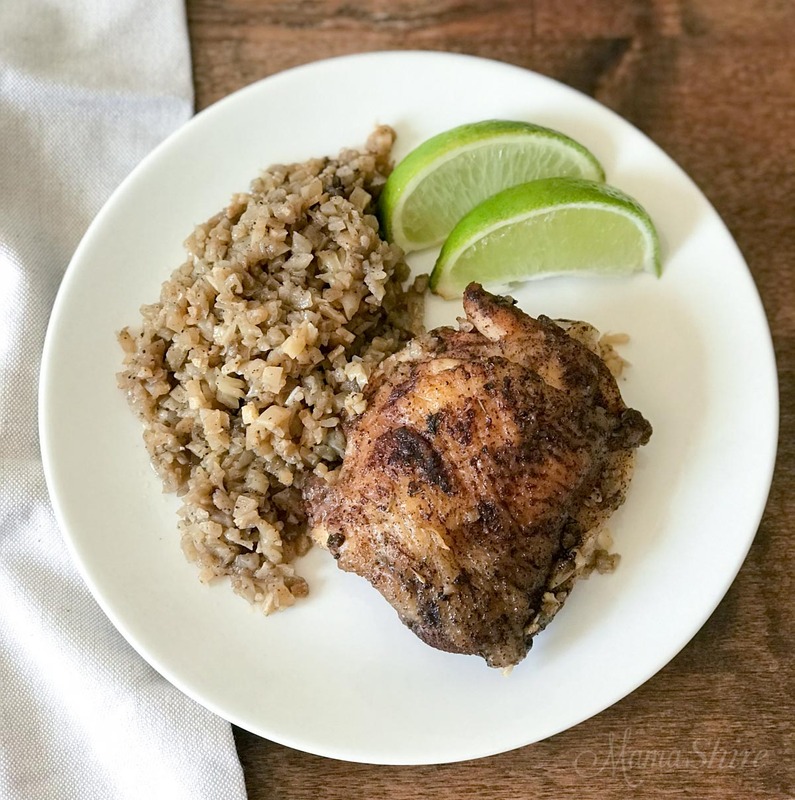 I decided to go with Jamaican Jerk Chicken & “Rice” because I used to use a store-bought Jamaican Jerk marinade for my chicken before our family went gluten free. And I hadn’t tried to recreate that flavor so I was excited to try Carolyn’s recipe for the Jamaican Jerk seasoning! I loved that this recipe was easy to make and I used only one pan! To make prep time even easier I used frozen diced onions and frozen riced cauliflower. All the recipes in Carolyn’s new cookbook look to be very easy to make and look so good – there’s a picture for every recipe! A few of the other recipes I’m looking forward to trying are Buffalo Chicken Chowder, French Onion Pot Roast, and Bacon Sloppy Joes. About half of the recipes in Easy Keto Dinners are dairy free! That’s really important for me as my family and cow-dairy just don’t get along well. 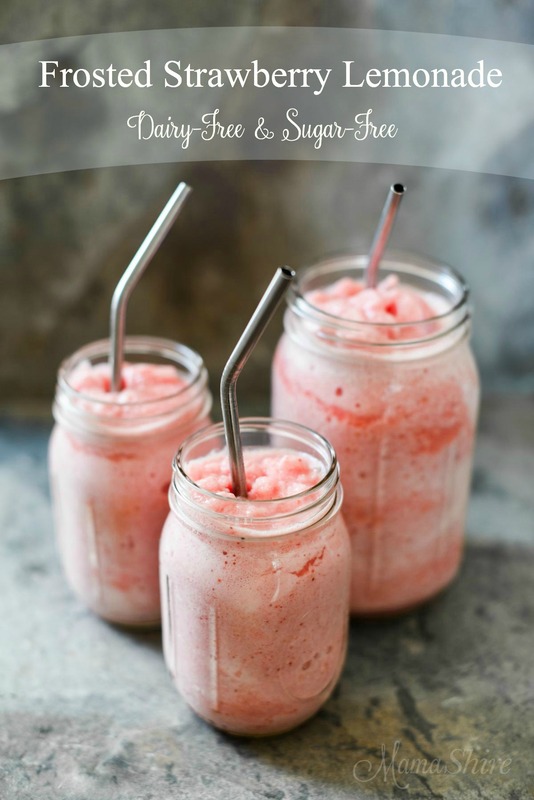 When I shared this with my daughter, she loved it and wanted to know where the recipe was because she didn’t want to ever lose it! She also told me she wanted to have this weekly! Well, okay then! 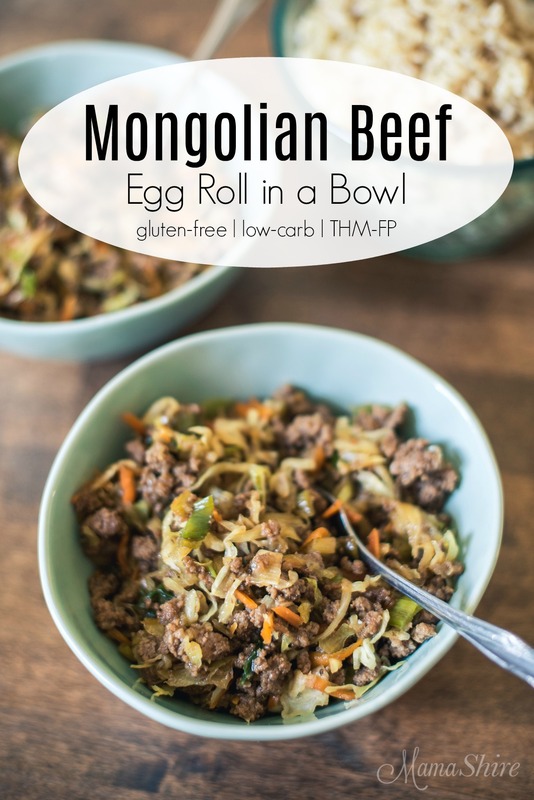 We gave this recipe and the whole book a 2 thumbs up! 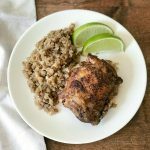 If you are following Trim Healthy Mama this recipe is an S.
Tasty One-Pan Jamaican Jerk Chicken & “Rice” from Easy Keto Dinners by Carolyn Ketchum. In a small bowl, whisk together the ingredients for the jerk seasoning. Rub the seasoning blend all over the chicken. In a large skillet over medium heat, heat the oil until shimmering. Place the chicken skin side down in the pan and cook without disturbing for 4 minutes, until the skin is golden brown. Flip the chicken and cook for another 4 minutes. Remove the chicken to a plate and add the onions to the skillet. Saute until translucent, about 4 minutes. Add the riced cauliflower and cook until just tender, another 4 minutes. Return the chicken to the skillet, skin side up, and transfer the skillet to the oven. Bake for 20 minutes, or until the chicken reaches an internal temperature of 165°F. Serve with lime wedges. Don’t skip the lime wedges! The lime juice pairs perfectly with the seasoning and adds a delicious zing to this dish! 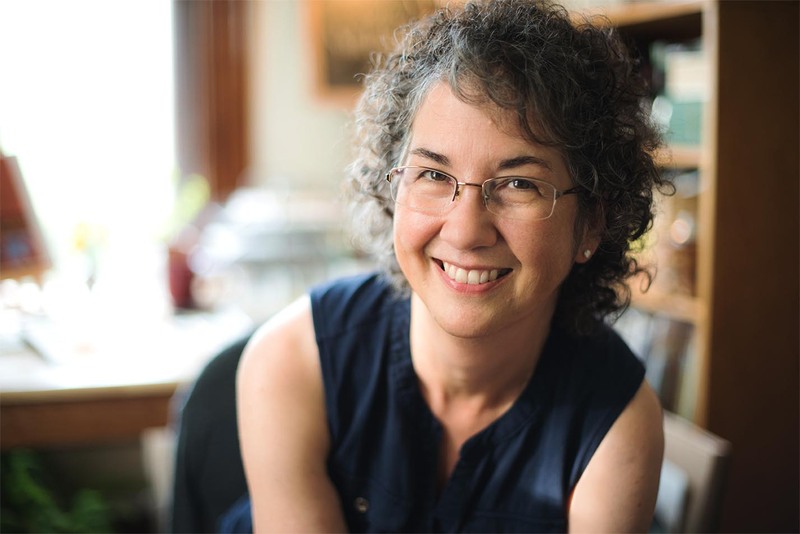 Be sure to visit Carolyn’s blog, All Day I Dream About Food, to see more of her delicious low-carb, gluten-free recipes! 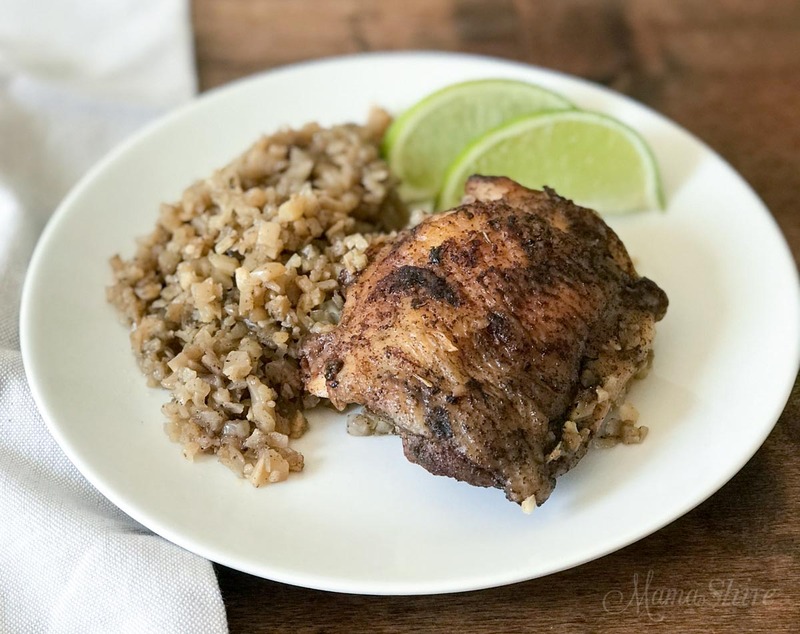 Save this pin for One-Pot Jamaican Jerk Chicken & “Rice” to your favorite Pinterest boards! 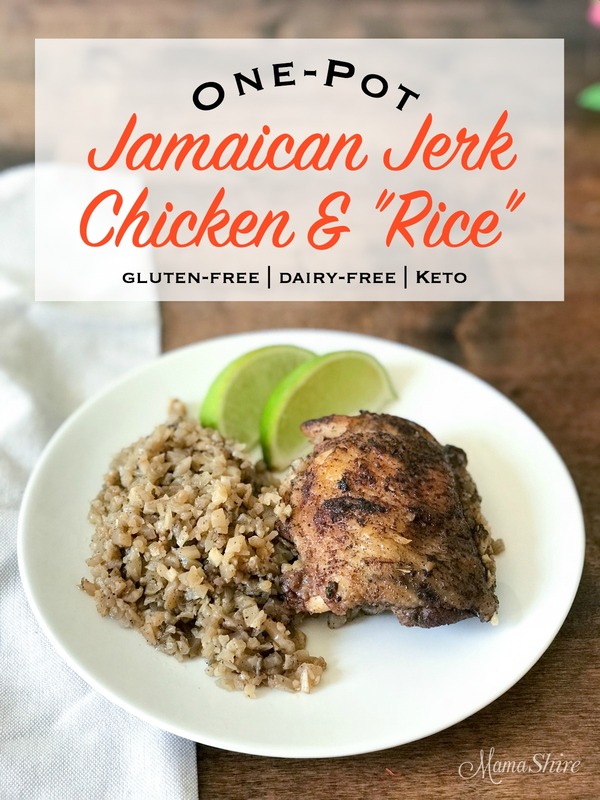 Quick to prepare and very good, especially the jerk seasoning. (I like my jerk spicy though; will add some cayenne next time). Only complaint is that my “rice” got way too soft in the oven. It took 25 min for my chicken to get up to temp. So either cook the chicken longer on stovetop or cook “rice” less before putting in oven. Or maybe both.